Determine which courses to take. Refer to the email you received from your academic advisor. It will tell you which courses you should register for to complete your degree requirements. In general, courses should be taken in sequence. For example, if you are currently taking CHEM 2, you should take CHEM 10 the following semester. Consult the Schedule of Courses at http://registrar.ucmerced.edu/go/schedule to ensure that the courses you want to take will be offered. Most courses have multiple components, such as lecture, discussion, and/or lab. Be sure to include all of the required components. Select lecture times first, then discussions and/or labs for each course. Record the 5-digit CRN for each component of each course. 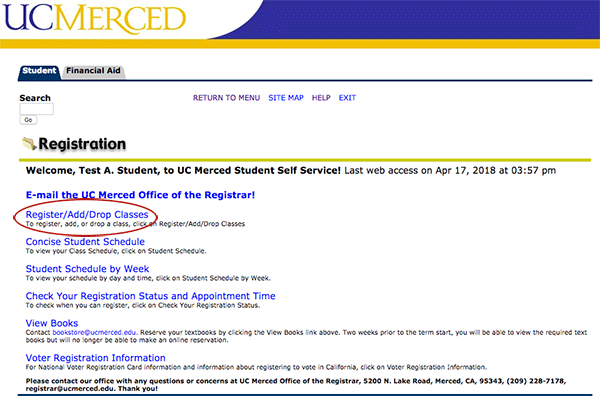 Log on to the student portal my.ucmerced.edu and click on MyRegistration in the Student Services drop-down menu. 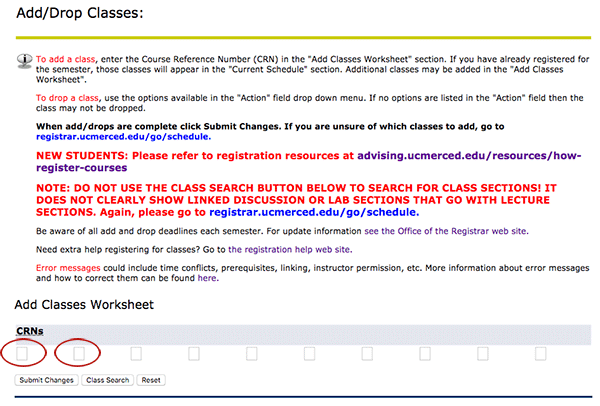 Screenshot: Log on to my.ucmerced.edu, then select the myRegistration link. To register for courses, select Register/Add/Drop Classes. Select the appropriate term, then enter one CRN in each box under Add Classes Worksheet. 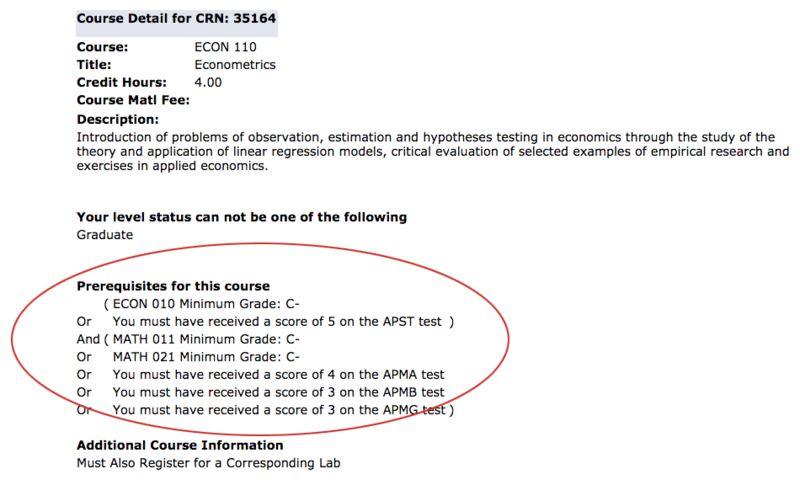 You must input all associated CRNs (lecture, discussion and/or lab) for a course at the same time. Click Submit Changes. Verify that you successfully registered for each course. 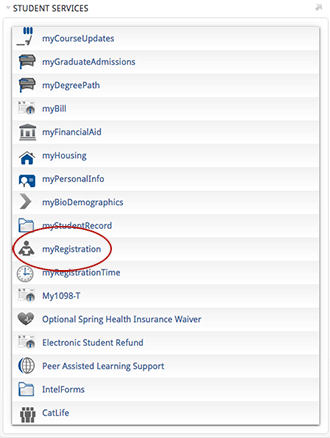 If you have successfully registered for a course, "Web Registered" will be displayed in the Status column. 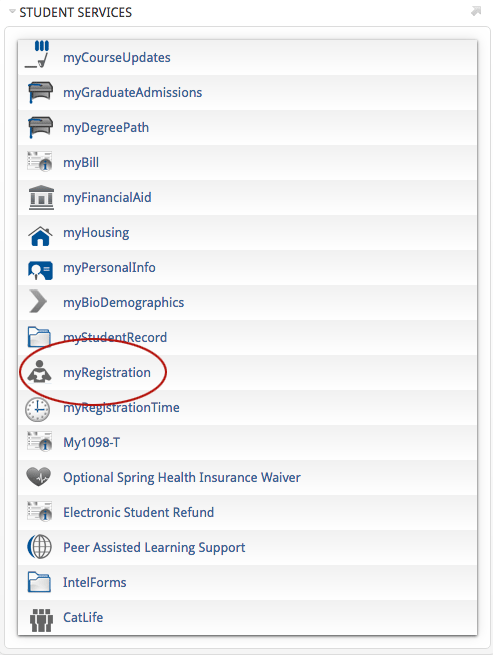 Screenshot: If you have successfully registered for a course, "Web Registered" will be displayed in the Status column. If you encounter errors, pay close attention to the status on the far left. Screenshot: Registration errors will appear under the far left "Status" column. MATH 5 is a hybrid course which means that students will only be attending their chosen discussion sections. In order to register for MATH 5, you must register for both a course CRN and a corresponding discussion section CRN. Disregard the “TBD” for the lecture time. 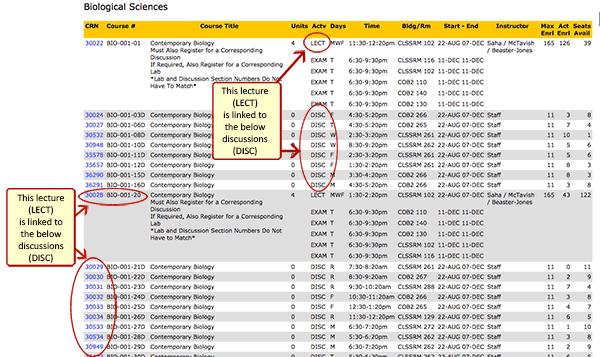 Screenshot: To register for Math 5, enter both a course CRN and a corresponding discussion CRN. 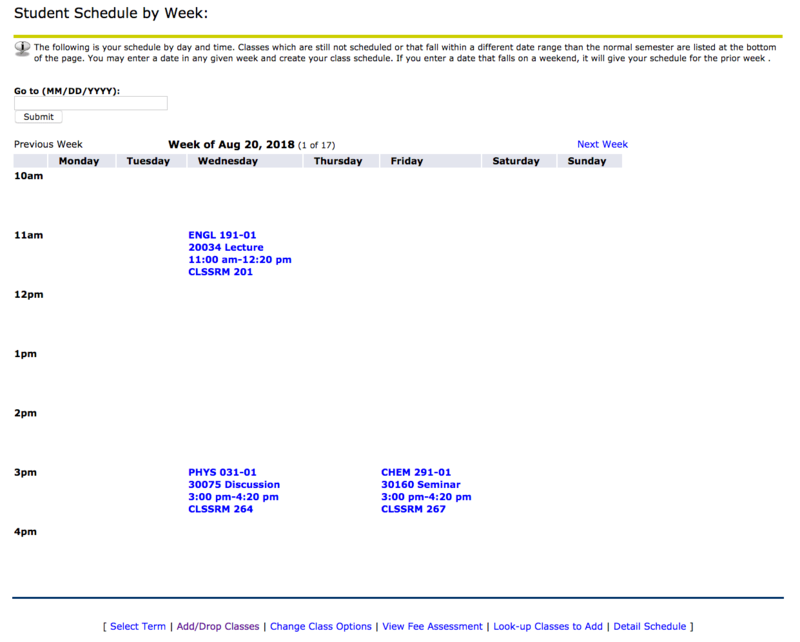 After successfully registering for your classes without any holds or errors you can see an overview of your schedule. Select the Student Schedule tab at the bottom of the screen. Screenshot: Select Student Schedule to see detailed information about your classes. In the Student Schedule view, you can see detailed information about your classes, including the days, times, locations, instructors and more. Next, select Student Schedule By Week to sort your schedule by day and time. 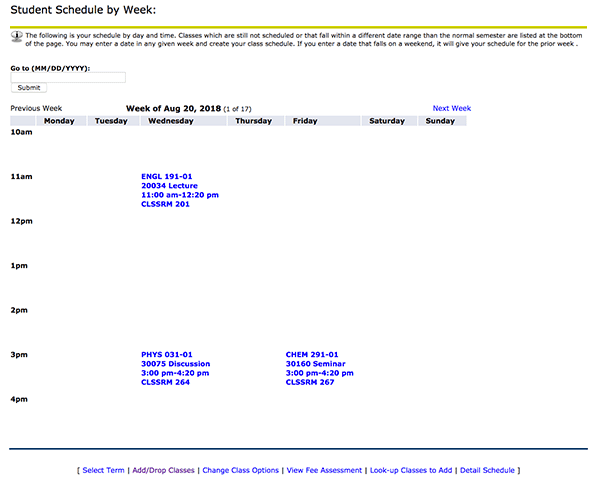 Screenshot: View of Student Schedule. Next, select Schedule by Week to see sort your schedule by day and time. In the Student Schedule by Week view, you can enter any date and you will see your class schedule for the week in which that date falls. If you enter a date that falls on a weekend, you will see your schedule for the prior week. Screenshot: View of Student Schedule by Week. You may get a "Linked Course Required" error if you have not enrolled for all parts of a course. For example, a course lecture (LECT) may be linked to a corresponding lab (LAB) and discussion (DISC). You must enroll in all components of a course at the same time. For each lecture, there are a list of discussions that you can enroll in, choose one discussion section that is open. 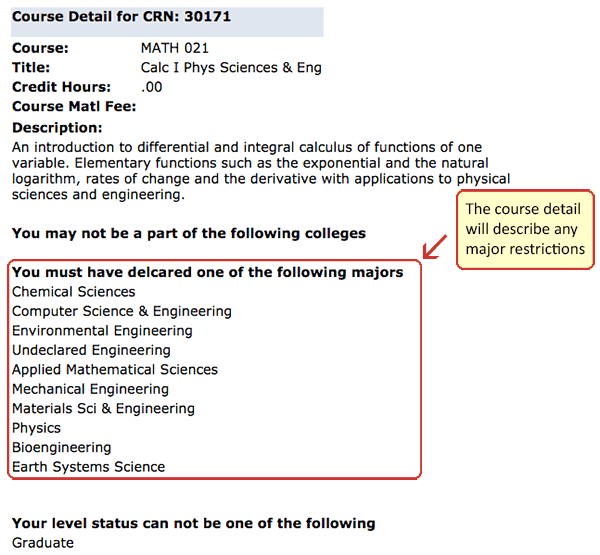 You may get a "Major, Minor or Concentration Restriction" error if a course you are trying to add requires you to be declared in a certain major. You should choose another course or contact your advisor for assistance. Find out which courses are restricted by major in the course schedule at registrar.ucmerced.edu/go/schedule. 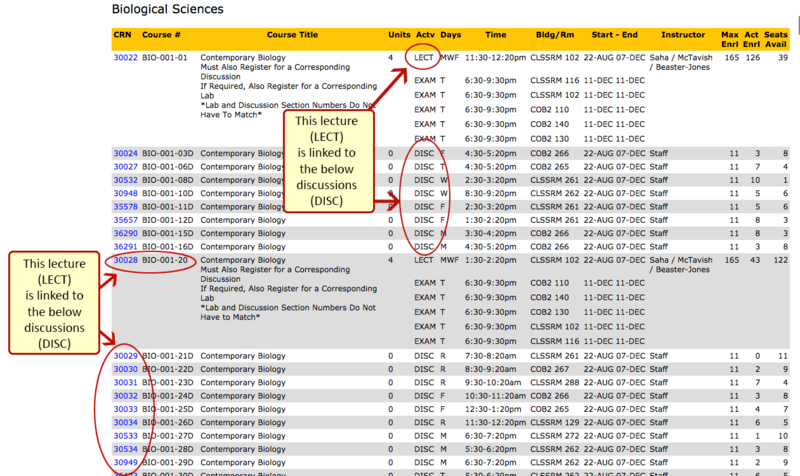 Select the hyperlinked CRN for a course to view course details. 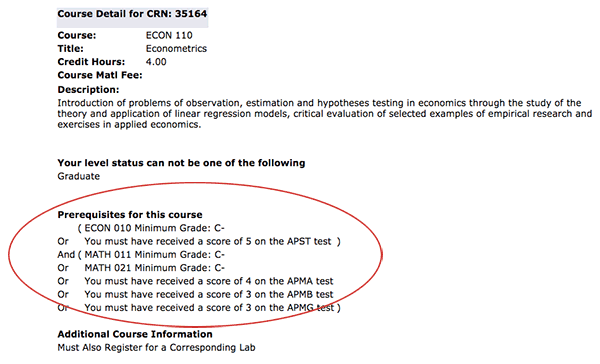 You may get a "Prerequisite Not Completed" error if the course you are trying to register for requires you to complete another course first. 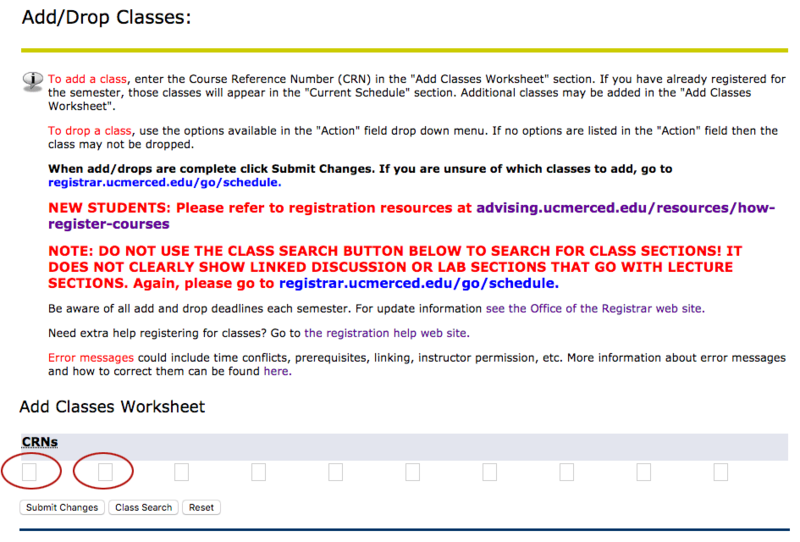 To see prerequisites for a specific course, select the hyperlinked CRN in the course schedule found at registrar.ucmerced.edu/go/schedule. You can also view the University Catalog for course prerequisites. Contact your academic advisor if you need assistance. 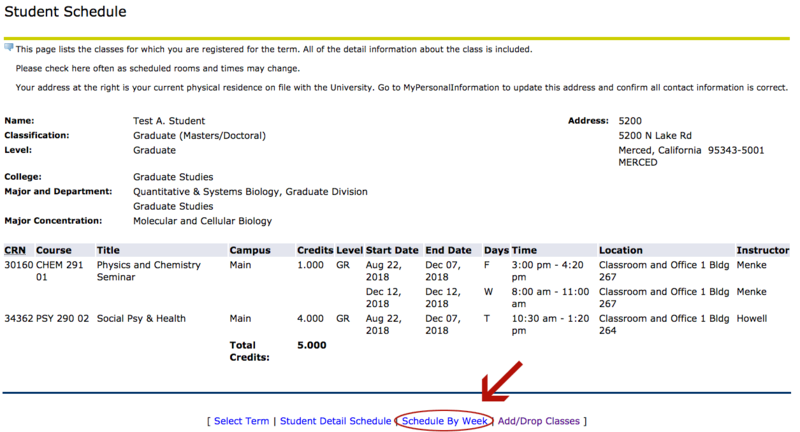 You may get a "Time Conflict" error if you are trying to register for two courses scheduled at the same time, or if the final exam time for one course is the same time as another. Remember, a time conflict may be with a lecture, discussion, lab or final exam. Try to register for another open section of the same course, or register for a different course. You can complete a Time Conflict Override Form. Be sure to contact your academic advisor if you have any questions.